We’ve had some friends staying this weekend, Mat and Jane, who we worship and adore and who we see a few times a year for some high jinks or a little excursion abroad. The last jaunt we had was to Rome, where we spent most of our four days wearing Pope masks and being simultaneously grinned and scowled at by the Romans. Anyway, Mat and Jane joined us this weekend for a BBQ hosted by some other friends. Just last week, it was announced that Banksy was launching his own Disney theme park alter-ego, Dismaland. An irreverent, seditious take on the sugar coated world of princesses and fairy Godmothers. Right up our street as it happens, very excited were we. We know that Mat and Jane have an approximate 4 hour journey to and from us, so trying to squeeze a visit to Weston-Super-Mare this weekend was optimistic. But decide to go we did, and today would be the day. We’d manage the queues and we’d manage the rain. We’d also try and get ourselves to the front of the queue by falsehood and trickery, or by cunning ingenuity and brilliance. So we decided to dress up. And go as Disney Characters Gone Wrong. Jane would be Sinderella, Mat would be Prince Charmless. John as Peter Pants and I would be his Stinkerbell. There was limited time and limited resources, my friends. But I decided that this would be in our favour – as surely, Dismaland did not require polished perfection from our costumes. No, the more dismal the better. Mat, is about 6’4″. And of slender build. But prising him into my daughter’s 28″ waist jodphurs, was no mean feat. They wouldn’t do up, but when I say he looked absolutely, perfectly ridiculous, you need to believe me. Laughter became painful, put it like that. Jane was the lucky recipient of a wedding dress that I keep in the attic for costume purposes. It subsequently became soiled with fag ends, dirt and tomato sauce, trampled on and thrown around. Sinderella would have love bites and a bottle of gin. 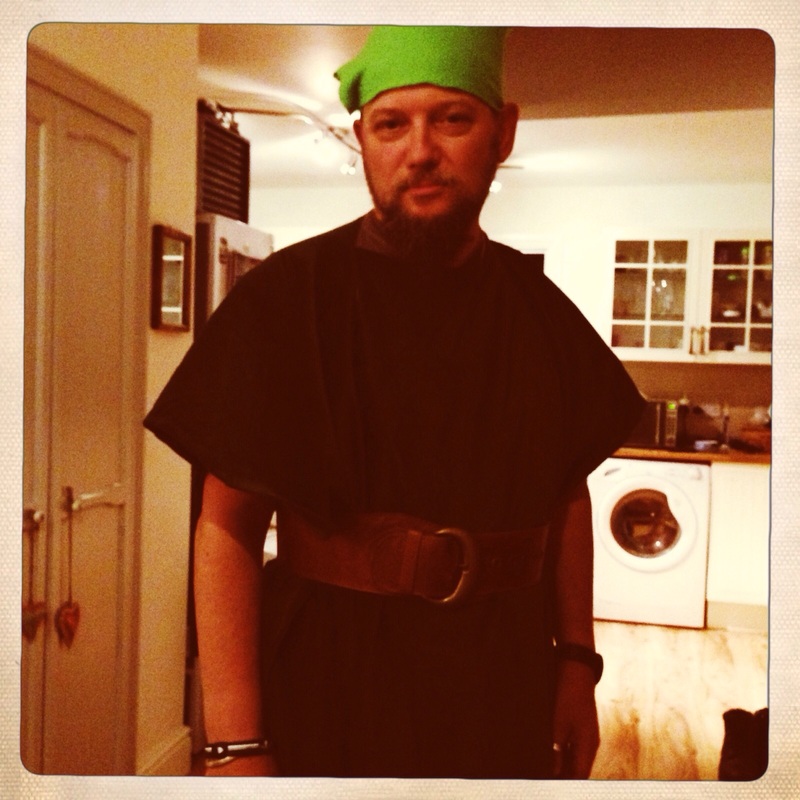 John had a piece of green velvet thrown at him with a head hole cut out and a brown belt. The hat was fashioned from a piece of green felt and vinyl, with a 1″ feather. It took about 30 seconds to construct and looks it. His legs were more of a challenge – no lime green tights in our possession people, I can happily reassure you. But I persuaded him to clamber into a pair of my black fleece-lined tights – one of the best inventions ever, I hasten to add, thank you whoever thought of those, and I swear there was a kind of dreamy look of enlightenment in John’s eyes as he put them on. “He get’s it”, I thought. “Welcome to the world of fleece-lined tights, my darling“. His legs were then bandaged in lengths of lime green felt, with a sort of nappy construction around his nether regions, a bit like a gangrenous baby. I ended up with a black tulle skirt and a pair of fairy wings fashioned, ahem, out of cardboard and sanitary towels. Stinkerbell would be a fag smoking, special brew drinking fairy. She would possibly have a black eye. Squeal! Costumes were complete, we could not wait! So this morning, as I reached out for the matchsticks as my alarm went off, and prised my eyes open, the sound of torrential rain met my ears.